The Reverend Harvey Webb arrived in Duluth in October 1869 and began conducting Methodist church services at Portland Township’s schoolhouse on Superior Street at Third Avenue East. 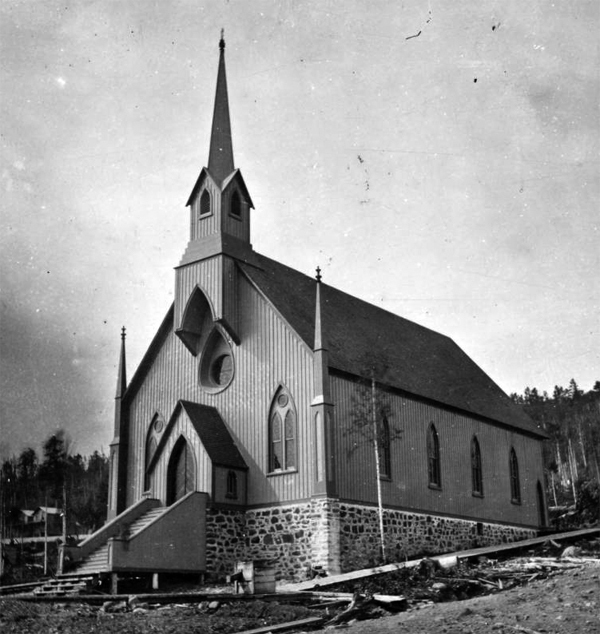 In 1870 his congregation (including trustees Luther Mendenhall, George C. Stone, and Clinton Markell) took a loan from Jay Cooke’s Western Land Association and built their first church building, a wood-frame structure with Gothic details, at the northwest corner of Third Avenue West and Second Street. The Panic of 1873, which had bankrupted Cooke, took its toll on the church as well: many of its members ran businesses financed by Cooke. By 1882, First Methodist had just eighty-six active members. But Duluth boomed back in the mid-1880s, and so did the Methodist congregation. They purchased lots directly behind their church in 1886, and in 1893 the congregation moved straight up from the old church to a new and very large Gothic church of red brownstone. The imposing structure (built for $120,000 or nearly $3 million today) had a tall square corner tower with a belfry and a shorter tower along the avenue. A Gothic window faced Third Avenue and a stained-glass rose window graced the Third Street façade. It sat 1,600 people. 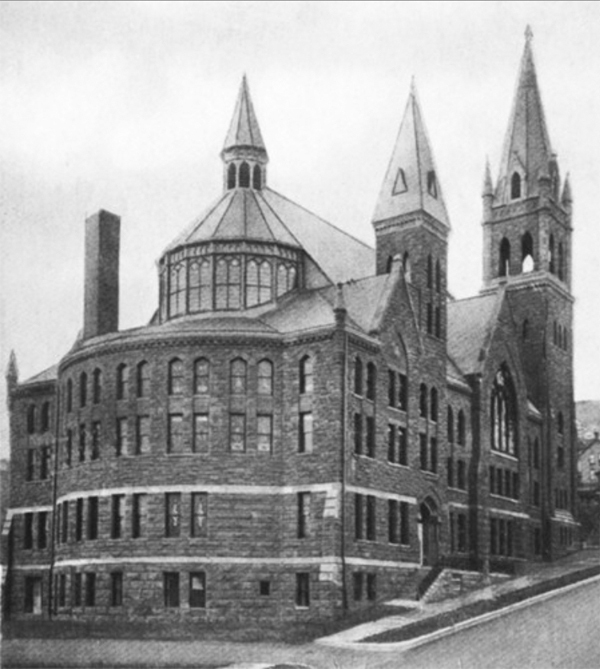 In 1925 the congregation built a community building called “The Meth” on the site of the first church, which had been dismantled, moved to Virginia, Minnesota, and reassembled as Virginia’s First Methodist Church. Chimes were gifted to the Methodist Church in 1921 by Thomas and George Martin in memory of their mother, Sara Jane Martin. Forged of Lake Superior copper, the chimes’ ten bells weighed from 200 to 1,800 pounds each. They could be heard a mile away and rang every Sunday for services, each day at noon, and on national holidays — but never at funerals, as the Martins had stipulated. The chimes fell silent in 1966 when the congregation moved to First United Methodist Church (the “Coppertop Church,” designed by world-renowned church architect Pietro Bellushi) on seven acres along Skyline Parkway at Central Entrance. The parish then sold the chimes and the 1893 church. In 1969 the building was demolished to make room for a Duluth Clinic parking lot, now an Essentia Health parking lot.